In this Nov. 15, 2017 photograph, daredevil/limousine driver "Mad" Mike Hughes is shown with his steam-powered rocket constructed out of salvage parts on a five-acre property that he leases in Apple Valley, Calif. The flight suit of self-taught rocket scientist and limousine driver Mad Mike Hughes is shown on Nov. 11, 2017. Hughes constructed his latest rocket at the "Rocket Ranch" in Apple Valley, California. It's a five-acre property he leases from Waldo Stakes, the CEO of Land Speed Research Vehicles who's currently working on a project to make a car travel 2,000 m.p.h. 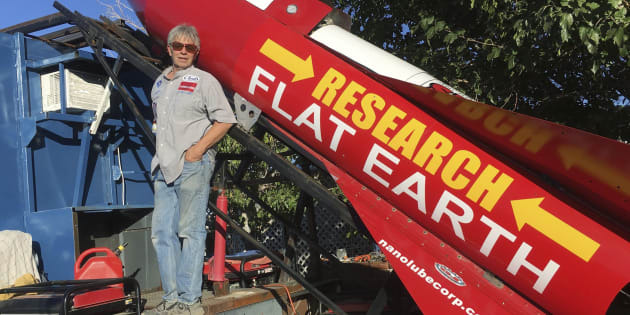 Mike Hughes' homemade, steam-powered rocket is shown on Nov. 15, 2017 on the property he leases in Apple Valley, Calif. The location of the jump will be Amboy, a ghost town in the Mojave Desert and along historic Route 66. The fictional town of Radiator Springs in the Disney movie "Cars" was loosely based on Amboy. On the morning of the launch, Hughes will heat about 70 gallons of water in a stainless steel tank and then blast off between 2 p.m. and 3 p.m. He plans to go about a mile — reaching an altitude of about 1,800 feet — before pulling two parachutes. They're discouraging fans — safety issues — but it will be televised on his YouTube channel. He said he's been in contact with the Federal Aviation Administration and the Bureau of Land Management.